Driving is not a child’s play. It requires tremendous concentration while you are in busy traffic. Many accidents take place because some factors disturb your concentration and thereby you lose control over the vehicle just for a second! You have to avoid such factors at any cost. 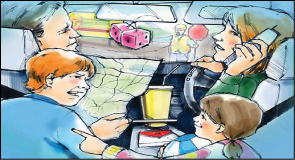 Always concentrate on driving, keep your eyes on the road and your hands on the steering wheel/handle. Never use your mobile phone while you drive. Don't drive in a distracted mood. Drive only when you are emotionally stable. If possible do not involve yourself in conversations with co-passengers. Use your horn sparingly and only to remind others of your presence. Do not eat or drink while driving. Always consume food when the vehicle is safely stopped. Never install a TV screen on the dash board. Avoid using ear phones when you are riding a bike. Do not drive when you feel sleepless or feel sleepy.